Although the task might seem daunting, decluttering your home can improve your life in a variety of ways. Not only will you be able to find items quicker but it can also help you to relax, improving your health in the long term. One main reason to declutter your home is so you have more space to move around in. Not only will this freed up space give you more room to breath, it will also mean that you have more space to store and organise important items. It won’t just be physical space you will gain. Clutter can be stressful and mentally draining for many people, so taking it away can clear your mind and eliminate the stress you feel about your cluttered home. One of the biggest reasons as to why people will decide to move house is because they have outgrown their current home. By throwing away unwanted items you can free up a lot of the space you have forgotten about. It would be easier to simply declutter your house than to find a new home and pack up all the clutter just to put it into another house. With no clutter to clean up you will be able to spend less time cleaning up after yourself and more time on more important things. Fewer items in your home should make cleaning up quicker and easier. This will mainly be to the fact you won’t have to constantly move items to clean around them. Removing old and unwanted items from a room can remind you of what the room originally looked like. It can also help to highlight the important items in the room that may have been hidden and forgotten about. With more space in your home you have more room to relax. It is easy for clutter to gather and this will often happen without you even realising. Having a home filled with clutter can make you feel trapped and overwhelmed by the amount that you will need to sort through. The more you ignore the clutter, the more it will build up and the more stressed out you will feel. Research has proved that a decluttered environment is good for your mental health. 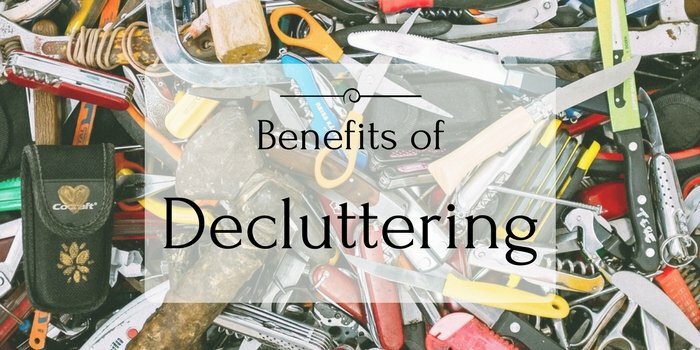 One of the main reasons for this is that a decluttered space feels a lot less stressful. Not only is a decluttered space good for your mental health, it is also good for your physical health too. This is especially the case if you have asthma or eczema. A dusty home can be hazardous to your health and it isn’t easy to effectively clean a cluttered home. Setting aside a certain amount of time a week to clean up after yourself can help reduce clutter build up. If you are already living with too much clutter and find it too much to handle, then you can always store the extra items in a storage unit before sorting through it all. This will allow you to quickly gain some room to breath while also giving you the time to sort through everything.